With the number of geek chic items on my wish list rapidly growing, it only seemed appropriate to quit hoarding these fabulous finds for myself and share them with ya'll this Wednesday afternoon. All of these on my list make your world just a little easier in one way or another and for that reason alone, they're worth investing in if you ask me. I have to tell ya'll about my favorites from this list. I've been a fan of Evernote for over a year now, so you can only imagine the excitement when I recently heard about the new Evernote Smart Notebook by Moleskin. This amazing collaboration uses Evernote's Page Camera feature to capture the pages of your Moleskin notebook with your smartphone or tablet, instantly transforming anything you write, sketch or draw in the notebook to digital format allowing you to save it, search it, and share it with the world. Another lifesaving invention is the PowerStick. Next time you're about to have a total mental breakdown because your lifeline (aka iPhone or Blackberry) has run out of juice, just take a deep breath and calmly reach into your purse to pull out the amazing PowerStick. The PowerStick, roughly the size of a stick of gum easily fitting into the smallest of clutches for your nights out, aims to replace all of your chargers with this one convenient power source, and is a lifesaver if you ask me. Get It Now by Postmates is a genius app, which I will be downloading as soon as it becomes available in NYC, but highly recommend for those of you currently in San Francisco. Basically, you can get anything delivered to you in under an hour. Delivery fees start from $5 and up, with services available 16 hours a day, 7 days a week...now that's what I can the perfect lazy person app, incredible! 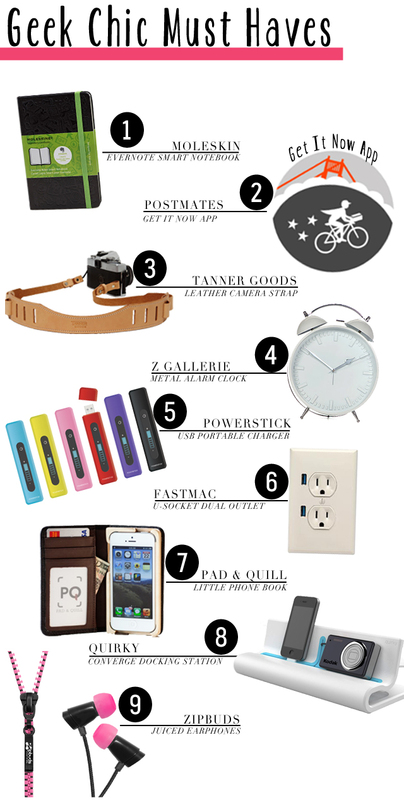 Do ya'll already own any of these tech gadgets? If so, would love to hear what you think of them and if they are as good as they sound! Hope you've had a good week so far!